Meet the shifter women who will do anything to claim their mates, and the women who love them. 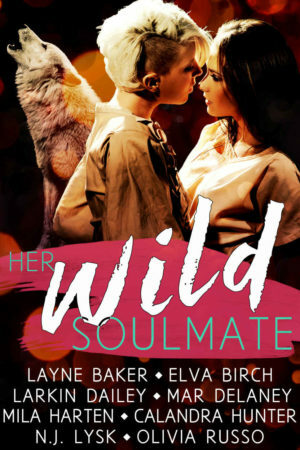 From sweet to sizzling, from dragons to wolves to moose, these eight standalone tales of lesbian shifter romance all have a guaranteed happily ever after! Fire Control, by Elva Birch. A dragon princess who can’t shift finds her mate in a hot-tempered, foul-mouthed Alaska wildlands firefighter and makes a stunning first impression by dropping a helicopter bucket of swampwater on top of her. Hop to Conclusions, by Olivia Russo. A rookie lawyer and bunny shifter finds that she just might have some common ground--and some terrific chemistry--with her ambitious and (literally) cold-blooded rival. Moose Madness, by Mar Delaney. Closeted moose shifter Maggie can't believe out-and-proud, motorcycle-riding werewolf Fiona is her fated mate, but even if they can overcome their differences, the town's chaotic moose festival and Fiona's overprotective pack just might break them up for good! The Gargoyle Gets a Girlfriend, by Calandra Hunter. Park ranger Gwen's worst nightmare--getting caught on video in her gargoyle form--has a silver lining when it leads her to meet her mate, Angie, a hiker curious to see the mysterious creature for herself. But can they stop the video from going viral? Gently Haunted, by Mila Harten. Single mom and egret shifter Mika was prepared for sleepless nights and diapers, but not for her daughter to inherit a magical legacy. Ghostly guardian Annette is here to help, but once she completes her unfinished business, how is Mika supposed to live without her? The Truth Speaks Itself, by N. J. Lysk. Kala didn't mean to come out at work, but she did--and now she needs a fake date for the office party. Lucky thing she has a leopard shifter best friend who'd do anything for her! The Fox's Christmas Mate, by Layne Baker. Fox shifter Cade is on the run to nowhere when she stumbles into Angela, a beautiful apple orchardist who’s been left one too many times. Can they heal each other’s wounds in time for Christmas, or are they doomed to spend the holiday alone? Zoe Chant writers contributed stories to this anthology under the names Elva Birch, Olivia Russo, and Mar Delaney.